Scroll down on this page for more interesting history, news articles, products, links, and information. Our next 2019 FREE SHIPPING Road Trip is still being planned. Here's how it works. Our delivery truck will be traveling from San Francisco to San Diego. If you are located along the route for that trip and can take delivery when we drive by, your shipping pre-order is free. *Call for details and the coupon code if ordering free shipping on line. Video "How We Make Bells" Video "Bell Tones", the sounds of the bells. 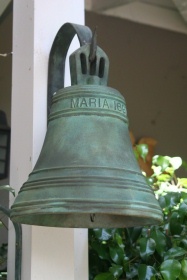 "San Juan De Lorena 1762"
This incredible bell will be a beautiful addition to your mission style home in need of a bell for your belfry or niche. 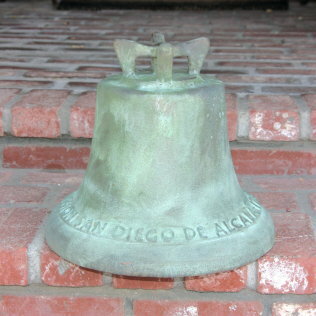 The bell is 20" in diameter, 2" larger than the classic El Camino Real Bell. 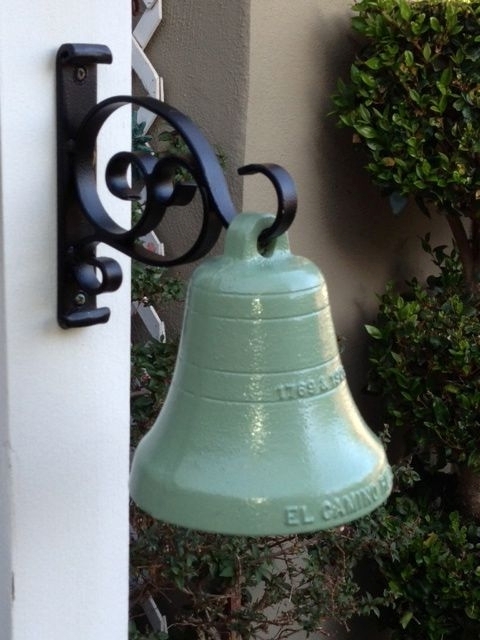 "San Diego De Alcala 1769"
"Mission San Diego De Alcala 1769"
This beautiful bell will be perfect to fill your niche at your mission style home. 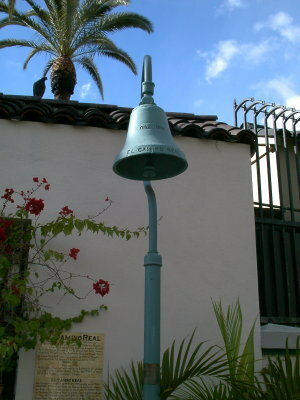 The bell is 15" in diameter, a bit smaller than classic El Camino Real Bell. It is be available in patina bronze, and aluminum. Produced from Mrs. Forbes original pattern of the 1920's. Designed by Mrs. Forbes in the 1920's. 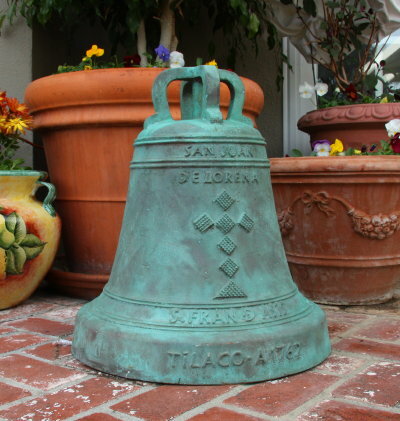 "El Camino Real Bell and bracket"
Iron Bell is 5 1/2 " tall and 5" wide. Designed by Mrs. Forbes in the 1906. On the back is "Copyright 1906 Forbes"
$429 in patina bronze. Designed by Mrs. Forbes in the 1920's. Yes we made these from 1914 to 1955! available as we find them in the old inventory. 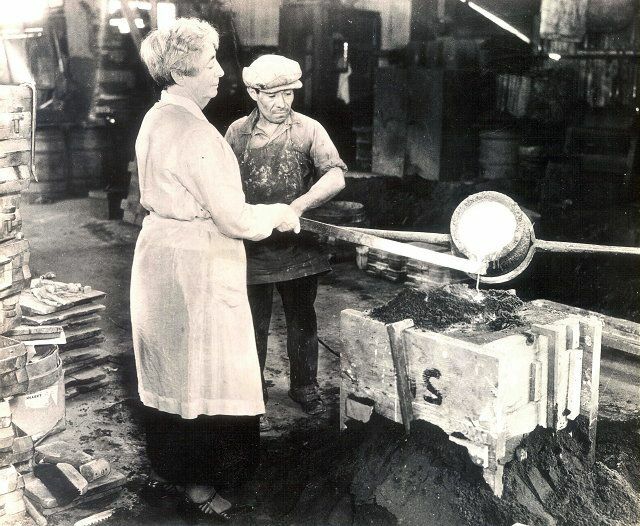 Proudly handcrafted in California since 1906! 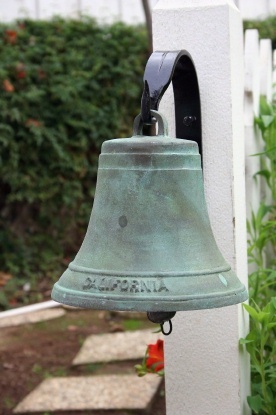 the 2 1/4" by 3" tall Mission San Fernando Bell . These small mission bells were made for each mission. Click here to see our bells or to order!
" The El Camino Real and It's Historic Bells"
Yes, we made them for Caltrans! or point of historical interest. 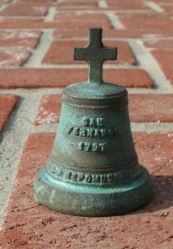 $2,195 Bell made in cast iron or aluminum with staff and connectors. $2,995 Bell made in verde patina bronze with staff and connectors. $1,295 Bell alone in cast iron or aluminum. $2,195 Bell alone in patina bronze. Click here For More Bell Information! Looking For Bells from 1" to 13"? In 1769, The El Camino Real, or Kings Highway, was just a footpath begun by the Franciscans and led by Father Junipero Serra who was a deciding influence in establishing the California Missions north from San Diego to Sonoma. Each Mission was situated in areas where large populations of indians lived and where the soil was fertile enough to sustain a settlement. As time progressed and more missions were built, the footpath became a roadway wide enough to accommodate horses and wagons. It was not, however, until the last Mission in Sonoma was completed in 1823, that this little pathway became a real route. 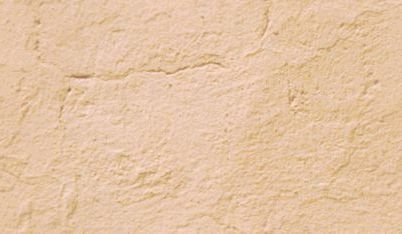 El Camino Real is the Spanish name for the historic road that joined the twenty one Franciscan Missions, the Pueblos and Presidios in the early days of California. Many of the Missions have been restored and the Kings Highway now is a magnificent modern road leading from San Diego, via Rose Canon, to Oceanside, then inland to Mission San Luis Rey and Pall from Oceanside to Mission San Juan Capistrano, Myford-Irving, Tustin, Santa Ana, Orange, Anaheim, Fullerton, LA Habra, Whittier, Mission San Gabriel to El Monte, Puente, Pomona, Claremont, San Bernardino, Redlands, Colton and Riverside. From Los Angeles El Camino Real leads to Hollywood, through Cahuenga Pass to Sherman Way thence to Mission San Fernando from Sherman Way to Calabasas, Camarillo, Ventura, Santa Barbara, Gaviota, Mission Santa Ines, Mission La Purisima, Los Olivos, Santa Maria, San Luis Obispo, Paso Robles, San Miguel, Jolon, Mission San Antonio, Soledad, Salinas to Monterey and Mission Carmel, or from Salinas to Mission San Juan Bautista, San Jose, Mission San Jose, Hayward, San Leandro, to Oakland from San Jose to Santa Clara, Palo Alto, Redwood City, San Mateo, Colombo, Ocean View, to Mission de los Dolores and San Francisco (Market and Third Streets). Across the bay, El Camino Real leads from San Rafael to Mission San Francisco Solano in Sonoma. The greater portion of El Camino Real is Highway 101, a part of the splendid system of California highways, is a continuous road over seven hundred miles in length and is marked by the unique and picturesque Mission Bell Guideposts which originally gave distances between the principal towns and directions to the Missions. The bells are placed along the road not merely as landmarks and guides to travelers but as testimonials to the work of the Franciscan padres who were the pioneers that settled California beginning in 1769. 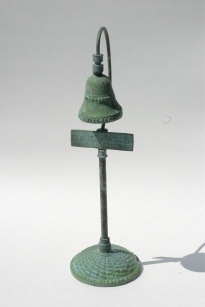 The miniature bells sold in mission gift shops since 1914, are replicas of the hundreds of Mission Bell Guidepost Markers found along the El Camino Real. Some of the old inventory made from 1914 to 1955 is still available from California Bell. The idea of placing a marker along the highway and in front of each Mission did not come about until August 15, 1906 when a cast iron 85 pound bell and piping designed by Mrs. A.S.C. Forbes was placed into the ground at the Iglesia de Nuestra Senora Reina de Los Angeles, also know as the Plaza Church near Union Depot in Los Angeles. 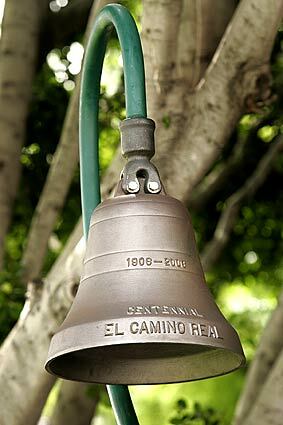 The bells were inscribed, "El Camino Real 1769-1906." The dates reflect the founding of the first Mission in 1769 and the dedication of the first bell in Los Angeles on August 1906. 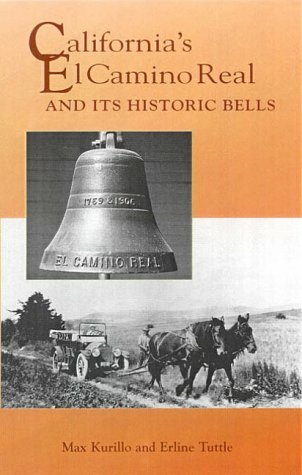 The plan had been to place one bell along each mile of the El Camino Real Highway, in front of each Mission, and also selected historical landmarks. By 1913, a goal of 450 bells was reached. 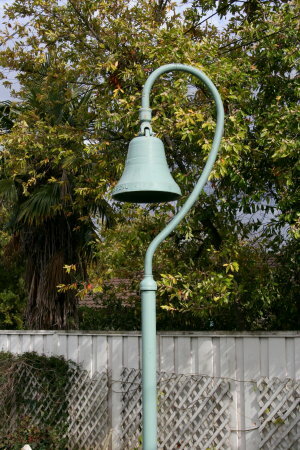 One bell was placed in front of each Mission and the balances were placed along the El Camino Real Highway. Since then many bells were lost to road reconstruction and theft. 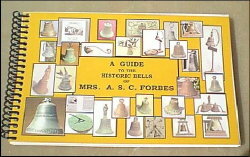 "The Centennial Bell of Los Angeles"
Dedicated August 15, 2006 at Olvera St.
"A Guide to the Historic Bells of Mrs. A.S.C. 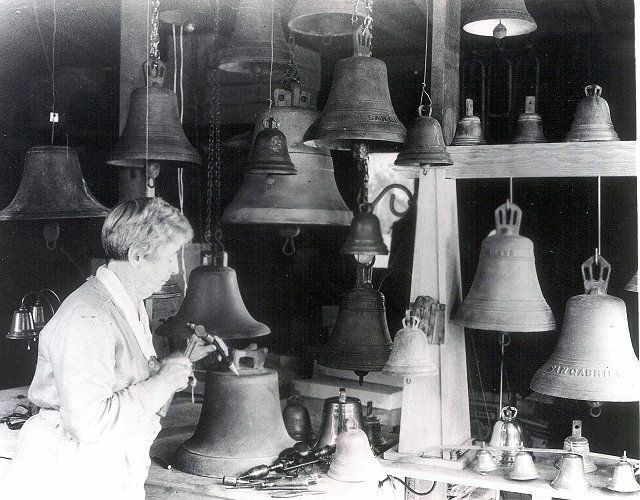 Forbes"
"California's El Camino Real and It's Historic Bells"